potential to delve into political wranglings that I do not wish to enter. Nevertheless, I want to write about a side to EMS that very few have seen. 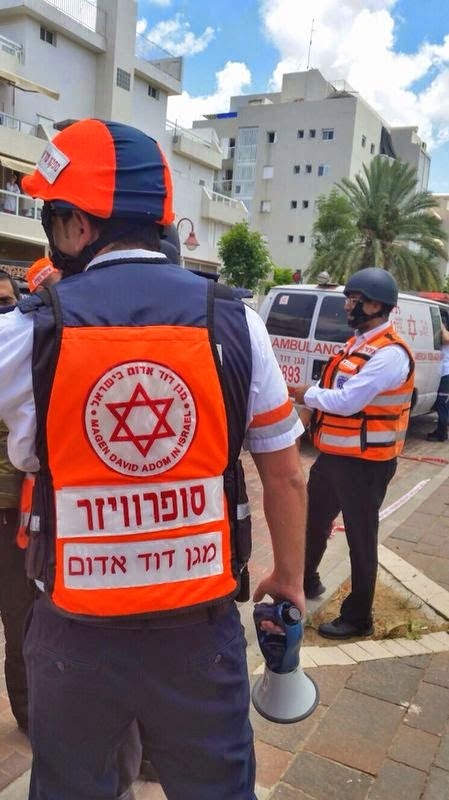 The national ambulance service is called Magen David Adom - Red Shield of David - (follow them on Twitter here) and is an affiliate of the international Red Cross. It serves a population of some eight million people in times of peace and war. It has in the past sent crews to disaster zones such as the Philippines, Haiti and Turkey. It has dealt with mass casualty incidents from which the world has come to learn. It is, however, or at least tries to be when circumstances allow, just an ambulance service treating its population for all manner of illness and injury as is seen in any normal (for want of a better word) part of the world. The last two weeks have been a little unusual, to say the very least. Treating patients has taken on a different sort of urgency, when the decision making process doesn't only include what the best treatment options are, but also where is the nearest point of safety for when the air-raid siren sounds. Each ambulance now carries ballistic vests and helmets. Enough for each crew member plus one patient. However, what if there is more than one patient? What if someone is accompanying our patient? If the siren sounds, do we stop and seek shelter, taking time to help our patient out of the ambulance and into hiding and increasing the risk for all of us, or do we keep going to the hospital and hope that the inbound missile heads elsewhere? We have been sat on station when the siren has sounded. At the same time, a call comes in. The rules dictate that after any siren, we need to take shelter for ten minutes, giving time for the threat to disappear, for any shell fragments to stop falling, for the Iron Dome anti-missile system to do its job and destroy the inbound terror. Do we wait for those ten minutes? Do we follow the rules, or do we break them, heading out for whatever that call is that has just come in? What if the call is for someone having a heart attack? Or someone having a baby? Or for someone who has stopped breathing? At times when seconds count, can we afford the luxury of minutes? I'm fairly lucky. I'm not near where most of the missiles are landing. Parts of Israel, particularly the southern region near the Gaza border, are facing dozens of missiles every single day. Paramedics there are making these decisions call by call, minute by minute, whereas I've only had to think about it on a few occasions. It is somewhat of an understatement to say that these are very strange days and this is a very strange place to be part of the world of EMS. However, it is times like this that the significance of this choice of career is suddenly very much in evidence. I look forwards to calmer days, where my decision making process goes back to the best treatment and the most appropriate hospital for my patient, and that the list of decisions and thought processes don't include where all the available bomb shelters are on my route from station to patient to hospital. I remember, 9 years ago today, that it was my first day off after thirteen shifts in a row. I remember, 9 years ago today, driving my car to the garage for its annual MOT test. I remember, 9 years ago today, walking the mile or so home to be greeted by a yell from upstairs telling me that there'd been "Some sort of power surge on the London Underground." I remember, 9 years ago today, of a shiver going down my spine and me yelling back "That's no power surge, that's terrorism. Just wait ten minutes for the official news." I remember, 9 years ago today, of running upstairs, putting on the uniform and boots that I'd thought were going to have a day's rest. I remember, 9 years ago today, of calling the garage, explaining, apologising, telling them I need the car back and that I'd rebook the test. I remember, 9 years ago today, running back to the garage, finding that they'd done the test, refused to charge me for it, and the manager saying "I hope it really is just a power surge." 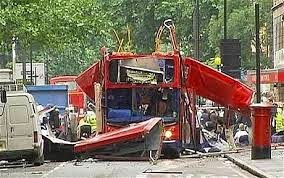 I remember, 9 years ago today, that London was taken back to darker days. To days of fear and terror and explosions and loss of life. I remember, 9 years ago today, that I was one of the lucky ones. I went to work, but wasn't in any way directly involved in the rescue operation around the bombings. I sat on station as backup in case it was needed. Friends and colleagues of mine were first on scene; some climbed into the bowels of the Underground to help survivors; some climbed through wreckage of twisted metal and twisted bodies. Many showed bravery above and beyond the call of duty. I remember, 9 years ago today, driving to work through eerily quiet streets, watching the horror unfold on screen, and wait and wait and wait for a call to come in, to be able to be a part of something, to be able to feel useful. For me, it was probably the quietest shift I ever had in London. For too many, it was a shift they'll never forget. Perhaps, next year, when the tenth anniversary comes around, there will be a more public acknowledgement of this day. For now, quiet reminders and private memorials will take place. The news outlets will remain resolutely silent, and the only people who will pause to reflect are those who were there - the injured, the families of those killed, the rescuers who raced into the inferno rather than run the other way.